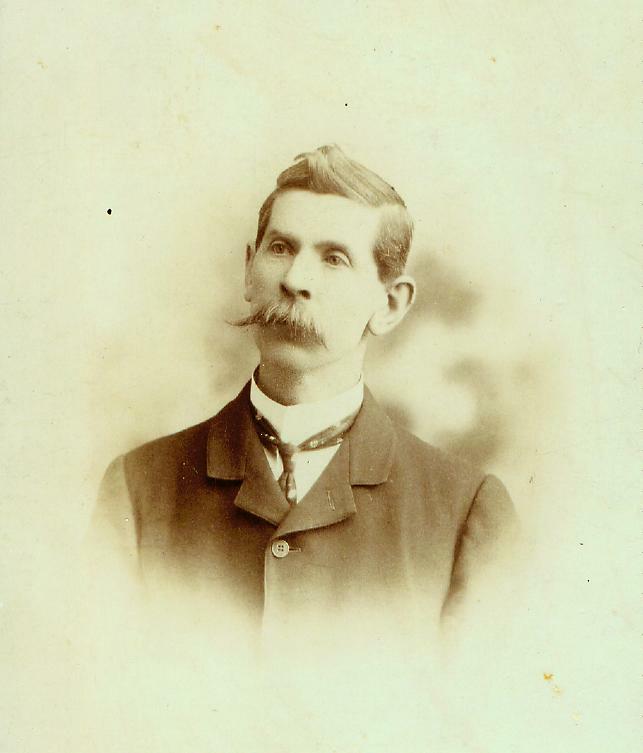 George Larkin was born in Roger's Court, Lurgan, Ireland in 1858. His father was John Lurgan. Father & son shared the occupation of "weavers". It was in Lurgan that George met Rachel Tumbleson. The couple married on July 12, 1879 at the Parish Church. The ceremony was witnessed by Samuel & Mary Brown(unknown). Rachel's father, Thomas Tumbleson, was originally from England. Her mother's name was Margaret, maiden name Moore. George and Rachel had 10 children(! ): George Jr., Robert, Elizabeth, Charlotte, John, Henry, Mary(Minnie), Joe, Thomas, and David. Church Place & Edward Street. Church Place leading to Market Street. The Larkins eventually made their way to Belfast. George and Rachel resided at 122 Tennant street(George died there on October 23rd, 1943, of "myocardial degeneration"). 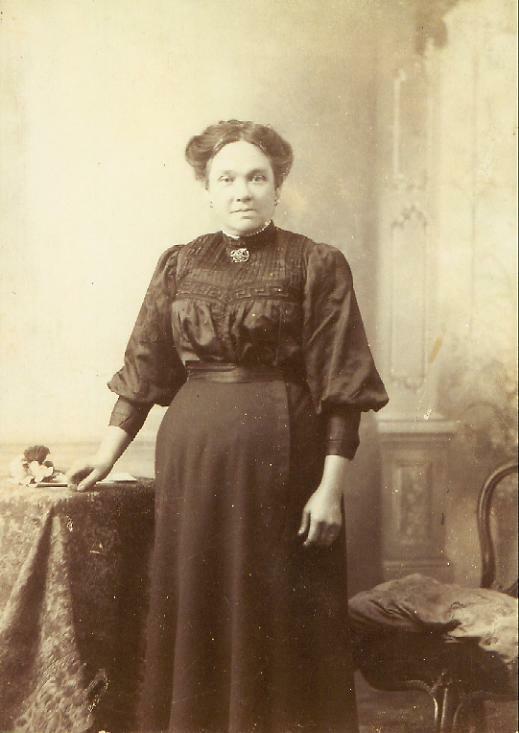 Robert married Elizabeth Robinson(on December 31, 1900), whose father was Captain John Robinson(born 1854 in Ireland), and mother was Jeannett (Moore) Robinson(born in Ireland in 1852). Robert and Elizabeth resided across the street at 147 Tennent Street. They had 5 children: Rachel, Robert Jr., Alfred, Marion, and Gwendoline(click HERE to learn about another child) . Robert Sr. worked as a "hackle setter" at the Lindsay-Thompson linen thread mill. Unlike many others, Robert was welcome on both sides of the Catholic/Protestant line in Belfast, as he was a labor-union man and distributed the disability checks, each Saturday, on his bicycle. He was a pacifist for religious/spiritual reasons, and refused to support or participate in violence for any cause; thus his refusal to join either the Orange Lodge (which resulted in permanent alienation from his father, George) or any IRA group. From Ted Larkin, son of Al..."Dad told stories about being sent round to the back door of the neighborhood pub in Ireland ("the local"), after supper, to fetch a mug of beer for his Pop; evidently that's the only way it was sold (bring your own mug - no bottles). However, Dad told me that his father was a "Temperance man", that he reportedly never touched hard liquor, and rarely indulged in any alcohol. As a child, I was fascinated by grandpa's pipe; it had a silver cap over the bowl to keep the ash in, and let the smoke out, and I loved to watch the smoke emerge from the holes in the cap and swirl like a genie around Grandpa's head." Al Larkin also remembered bullets hitting the upstairs walls of the house and coming in the windows upstairs. Once, he said, a grenade came through an upper-story window, but must not have detonated or there would have been casualties, and the house might not still be there today. Al always believed that the bullets were random, not personal, as they lived on a "border" street between Protestant/Unionist and Catholic/Republican areas. But you never know, anyone on either side might have wanted to do harm to a "non-joiner". In his later years, Al Larkin often talked of Ireland, and was especially fond of recalling family summer holidays on Island Magee, which is actually an 8 mile long peninsula near Belfast. Island Magee is a farming community that also has fantastic fishing. The family rented a guest house on a farm from a Mrs. Houston, whose husband had died, and whose sons were all sailors, sea captains, or fisherman, when they weren't farming. "One of Dad's earliest memories was being awakened at midnight or so, around mid-Summer, when the fishermen came in with the year's first catch of herring. The new potatoes would have just formed on the potato plants, small and sugary sweet; and everyone gathered in the kitchen for a late-night feast of "skerries" (boiled new potatoes) and fresh herring, with butter and salt and whatever else Mrs. Houston and Grandma put together. Our whole family is nuts about seafood, and Dad's description of the sweet new spuds always made my mouth water. When I was little, we also enjoyed fish and spuds at the seashore; but, it was Atlantic flounder and bluefish, with somewhat older potatoes (August reds); nevertheless, these are memories all the more enjoyable for knowing that two preceding generations of Larkins enjoyed summer fish 'n spuds as we did in New Jersey." "The other story of Island Magee that Dad always chuckled as he told us was: When Dad was very small, probably only 5 years old, one of the local fisherman, a neighbor, invited "wee Alfie" to ride in the rowboat with him, out into the (bay or ocean?) to check the set nets. This man was short, and was known all around town as Wee John, but Dad said he had arms like Popeye from rowing, hauling nets, and farming between fishing trips. Down to the beach they went, on a narrow path down the cliffs or between them, to a small beach; and off over the waves they rowed, about a quarter or half-mile offshore to the nets. After seeing that all was well, and not enough fish caught to haul the nets in, Wee John turned the boat around and started for shore, with Wee Alfie standing in the bows, peeping over the gunwale. Despite a life spent fishing the local waters, somehow, Wee John had miscalculated the time and tide, and found himself rowing against an outgoing tide! After a long time of rowing with almost no progress, Wee John getting winded, and Wee Alfie getting worried they'd never reach shore, John finally muscled the boat into an eddy or somehow else got them out of the offshore current and into a beach - tho' it might have been another beach from the one they started from. By now, all of John's sailor brothers and neighbors were out searching for John and Alfie along the shore, and when they found them, there was a rare mixture of relief and exasperated anger directed at John, for "endangering the child and worrying his mother" (I don't think Dad was ever in any real danger), and enormous mirth that an experienced fisherman had somehow missed the tide! I guess Wee John never lived it down, in the pub-talk, for years. If I ever go to Island Magee, I'll make sure the story isn't still a thorn in the side of his descendants, before I tell it!" 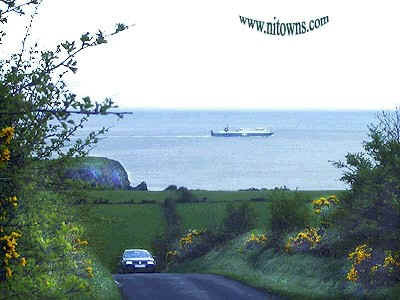 Portmuck, on the NE coast of Island Magee. 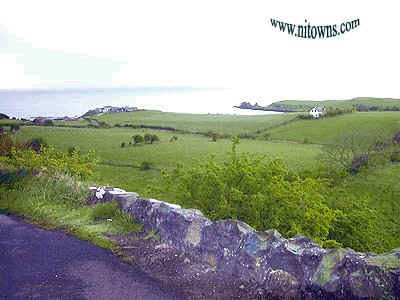 Portmuck and the surrounding countryside.